Greetings, Night Owl Reviews readers! 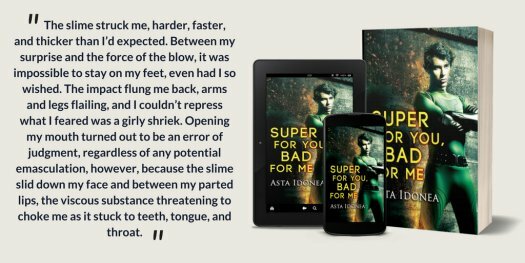 My name is Asta Idonea, and I am here today to introduce my new m/m gay romance superhero book, Super For You, Bad For Me. One of the big draws with superhero-dom is, of course, the superpowers. In choosing which special talents to award Oswell (and his nemesis) in Super For You, Bad For Me, I naturally had to go with what I needed to use in order to advance the plot and make the story work. However, if I were to acquire superpowers myself, my choices might be different. Here’s a list of what superpowers I would pick and why. 1) Immortality—Okay, maybe you could argue this isn’t exactly a ‘power’, but it is the thing I want most in all the world. Imagine all that extra reading and writing time if you could live forever! 2) Telekinesis—As Oswell discovers in my m/m romance book, this is a pretty flexible, all-purpose power. You can fly different objects around the room—even yourself in the right circumstances. Ought to come in handy. 3) Invisibility—Lots of uses for this one, from the benevolent to the selfish. If I could turn invisible, I’d probably become a super spy. Cue spy-show theme music! 4) Flying—If you can’t get telekinesis, even just flying on its own would be fun. I’d love to be able to see the world from above. Plus, it offers a quick commute or a handy way out of trouble. 5) Pyrokinesis—Who doesn’t love a good fire? With this power, you’d certainly be popular on camping trips. (Not that I’ve ever camped myself—too many bugs.) It might even save your life if you found yourself lost in the wild. What about you? If you could have one superpower, which would you choose and why?